Thursday was a public holiday in both Belgium and Holland and, with my car due to go in for its roadworthiness test on Monday, I took advantage of the sun to clean the car up a bit. Last weekend was carnival weekend. There were rides. Macsen drove. I while ago, The Register carried a story about a job ad that someone had spotted in Spain. It seems that Husqvarna are looking for a Madrid-based Automatic Lawnmower Supervisor capable of the demanding task of watching the grass grow while the Husqvarna Automower does the work for you. I think I have found the ideal candidate for the job. After a much deserved Easter break, we’re home. The holiday was an all-inclusive one, the most significant part of which was the all-inclusive child-care. And on the first day there, Macsen found a boat. Today Macsen turned five, and we had a party. As is traditional in Belgium (or this part of Belgium, anyway), the kids came straight from school. We fed them and unleashed them on the back garden. All in all, things went a lot better than I feared. I do find these sorts of things far too stressful, but things seemed to go reasonably well. And the kids enjoyed themselves, which is the main thing. I mean it about the clown proving invaluable. He really did earn his keep today. Over the past few months, Terry Pratchett‘s Nomes trilogy has made up most of Macsen’s bedtime stories. It’s not that we’re slow it’s just that every time we finish Wings, we have to go straight back and start reading Truckers again (we’re currently on our third pass through the series). Earlier today, Macsen was poking around in one of the bookshelves. It turns out he was stocking up on bedtime stories for the next few months. A few days ago, I had reason to leave my laptop unattended for a few minutes. 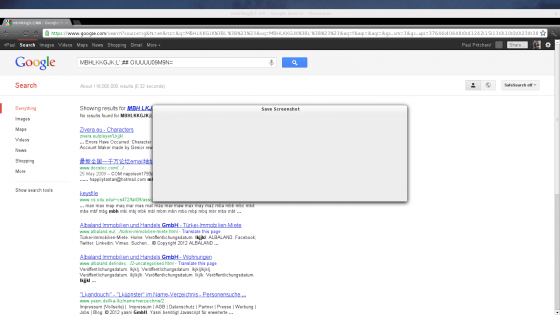 When I returned, I discovered that Macsen had been putting random search terms into Google. He’d also managed to lock the track pad, which worried me for a moment. Not bad for a four year old.